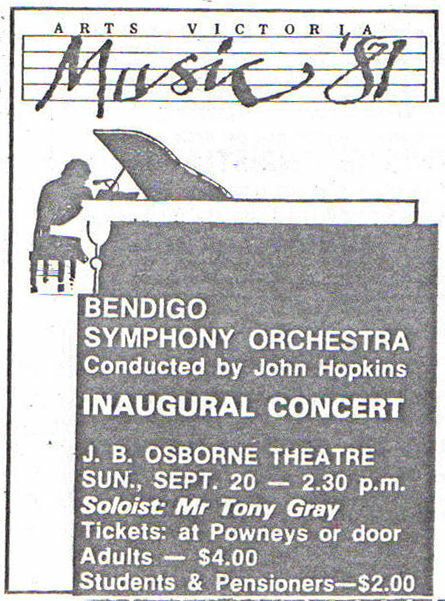 The Bendigo Symphony Orchestra was founded in in 1981 as a result of the Music 81 project of the Victorian Government, and was the successor of the Bendigo Concert Orchestra, which had played for some thirty years. 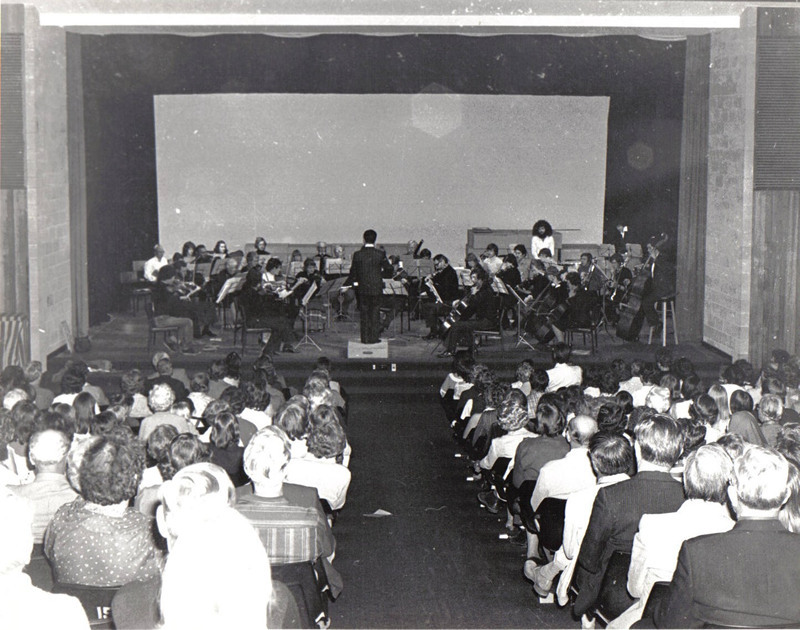 Since then, the orchestra has continued to present three or four concerts each year featuring a range of local, national, and international artists. 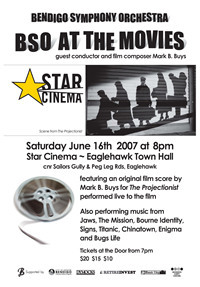 The orchestra’s repertoir is based in the ‘classical’ tradition – to date the orchestra has played all but two of the Beethoven Symphonies (7 & 9). 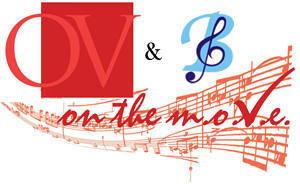 In addition, the BSO has been a strong advocate of local composers, giving a number of premiers of new works. 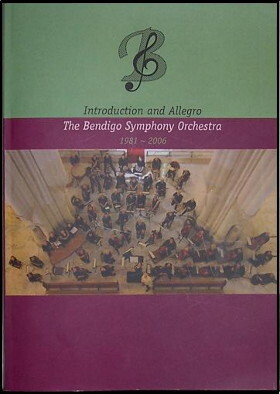 Edited by Rob Boxshall, this volume contains a history of the orchestra, as well as the recollections of a quarter of a century of music making as provided by past and present players. 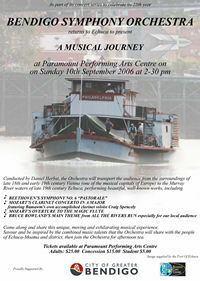 The volume is available directly from the orchestra; see the Contact Us page. 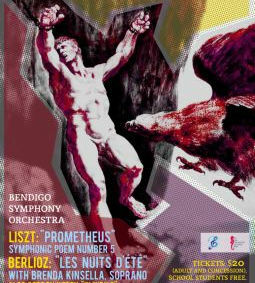 Conducted by Rohan Phillips and featuring Narelle Stone as narrator. 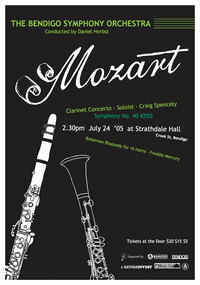 Mozart: Sinfonia Concertante in Eb Major for oboe, clarinet, horn, and bassoon K.297b featuring Michael Firth, Craig Spencely, Catherine Moore and Heather Steele. A free performance in the atrium of St John of God hospital. 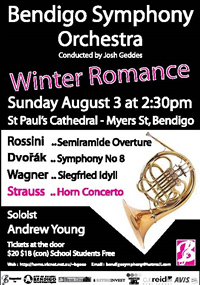 J.C. Bach, Viola Concert o 1st Movement, with Mat Chalmers; Franz Joseph Haydn, Oboe Concerto in C Major, 1st Movement, with Zoe Suckling; Anatol Liadov, Eight Russian Folk Songs Op.58; Leonard Bernsteine, Elegy for Mippy II, Bryn Walker; Wolfgang Amadeus Mozart, Symphony No 38 in D major the “Prague” Symphony; Camille Saint-Saens, Allegro Appassionato , with Ning Hall; Dmitri Shostakovich, Piano Concerto 2nd Movement, with Millie Heinrich; Jean Sibelius, Finlandia. 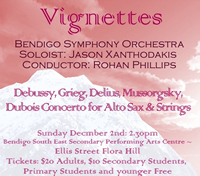 The BSO, Orchestra Vic and The Capital invited the BSO’s Facebook Friends to attend (as audience members!) 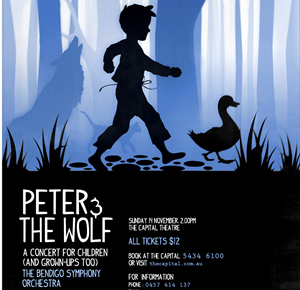 a free 2 hour orchestral workshop in the main theatre at The Capital. 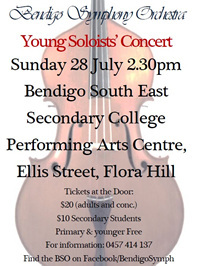 Run by members of Orchestra Vic for the BSO, working on some of the pieces to be performed in our concert on Sunday the 28th. 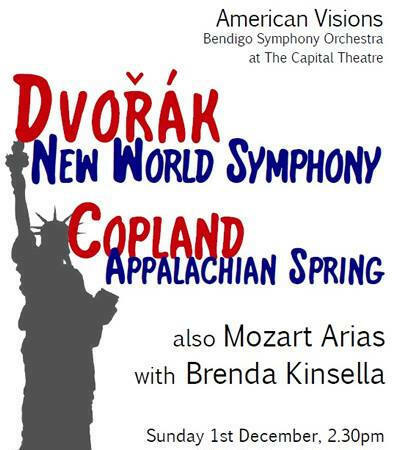 A free performance of Mozart’s Symphony No.38 (slow movt), Exsultate Jubilate with soprano Brenda Kinsella, & the Beethoven Violin Romance with soloist Marj Sutton. 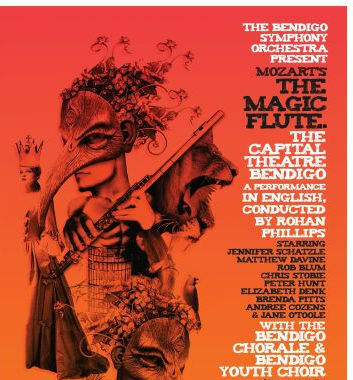 Mozart: “Magic Flute” overture, & “Exsultate, jubilate”, with Jennifer Schatzle, sop. 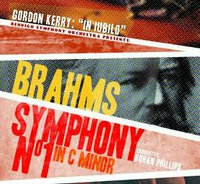 ; Sibelius: “Valse triste”, J.Strauss “The Beautiful Blue Danube” & Brahms, “Un poco allegretto e grazioso” from Symphony No.1; Corelli, Concerto VIII (arr. 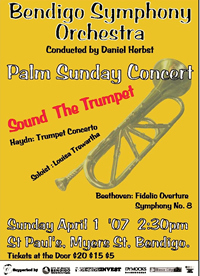 for full orchestra by R.Phillips), soloists Jeanette Stoll, Hannah Dallas & Cally Tromans. Mozart: Idomeneo overture & Symphony no.31 Paris and Haydn: Violin Concerto in G, soloist: Pam Scott, & Symphony No 82, the Bear. Haydn: Symphony No 82, the Bear. Rohan Phillips & *Daniel Herbst cond. 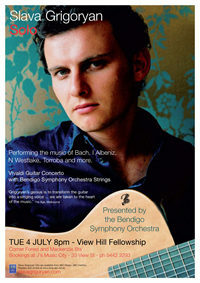 Guitar soloist – Slava Grigorian. 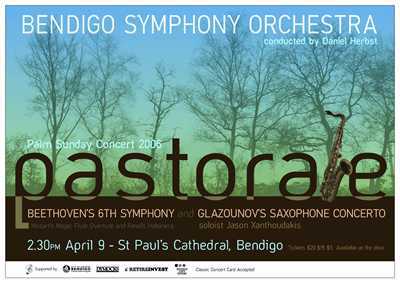 This was one item in an otherwise solo concert by Slava Grigoryan. 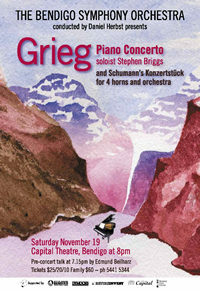 It was the only concert on his national tour in which he played with an orchestra. Daniel Herbst, Valerie Broad* cond. 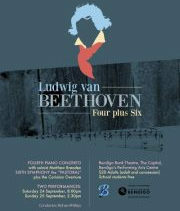 Beethoven: Symphony No.5 Daniel Herbst cond. 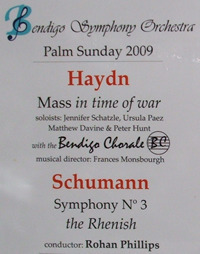 Pieces played by the Strings Daniel Herbst cond. 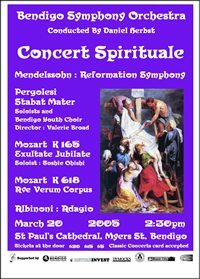 Sussmeyer: Finale from Das Namenfest, Bendigo Youth Choir (Valerie Broad). Handel: And The Glory Of The Lord, Zadock The Priest. 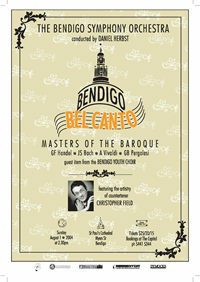 Bendigo Youth Choir, Bendigo Chorale, Bendigo Chamber Choir. Thomas Arne: Rule Britannia, Orchestral winds. 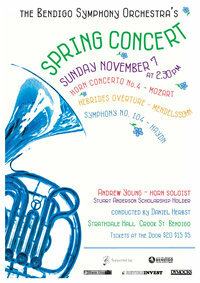 Soloists – Froncesca Jackson-Webb – Soprano, Amy Turton – Mezzo.